Prepare yourself for the fishing charter of a lifetime! Offering inshore Clearwater fishing, offshore fishing, flats fishing, deep sea fishing, and spear fishing charters in the St. Petersburg, Tarpon Springs, Clearwater, and Tampa areas, Monster Charters can take you where you want to go and get you there quickly and in style. Our captains have decades experience as Tampa fishing charter guides and know where the biggest grouper, tarpon, snook, and other fish hide to give you the best fishing charter experience possible. Using cutting-edge technology and our top-of-the-line fishing boats, we can give you theTampa fishing charter experience you’ve been searching for and more. You’re sure to have the time of your life with Monster Charters, not to mention catch some huge fish! 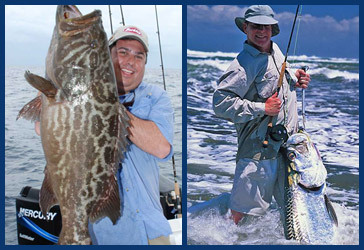 Whether you are after a prize Tarpon to hang on your wall or you are looking for some tasty Grouper, a St. Pete area fishing charter from Monster Charters is sure to send you home with everything you were searching for and more! Our captains have over 15 combined years of local fishing experience and are happy to share our knowledge with you. No matter what season it may be, we know where to go to find the fish. When you book a St. Pete area fishing charter with us everything you need for a full day of inshore or offshore fishing is provided. From all bait, tackle, and fishing licenses to coolers and ice for the food and beverages you bring along, Monster Chaters has got you covered! The only things you need to worry about are sunscreen and a way to get your fish home. 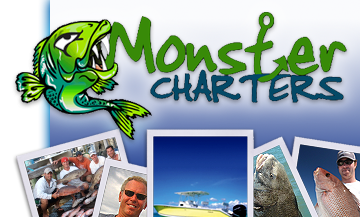 Let Monster Charters handle all your Tampa Bay fishing charter needs so that you can enjoy the Florida sun and come home with the ultimate catch. Contact us today for more information about area fishing charters and how we can help you!